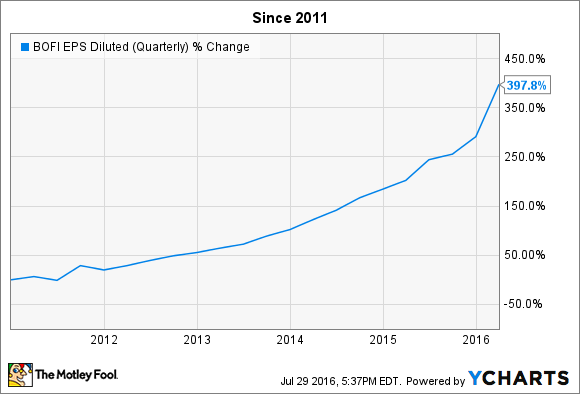 Will BofI Holding, Inc. Deposit Another Quarter of Growth? BofI Holding has been one of the fastest-growing banks for years, but short sellers and a market that's turned negative on banking have held the company's stock down, despite its stellar results. Here's a closer look at what to expect when BofI reports on Aug. 2. Steady loan growth and low costs have been a huge driver of BofI's profits for years. Image source: Getty Images. There seem to be two groups of investors actively following BofI Holding, Inc. (NASDAQ: BOFI) right now: those who think the stock is crazy cheap, considering the company's historical earnings growth and recent growth rate, and those who think the whole thing is a house of cards. 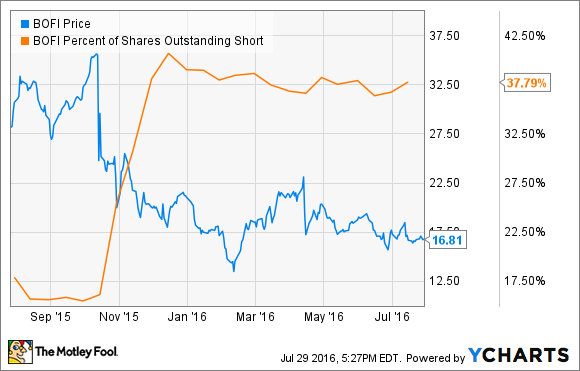 At nearly 40% of shares sold short, that's huge negative sentiment. The best way to sum it up right now when it comes to BofI Holding? Probably, "Whom do you trust?" Let's take a closer look at what to expect when BofI Holding reports its fourth quarter earnings on Aug. 2. BofI Holding has done incredibly well since the Great Recession, consistently growing its loan and deposit books and leveraging its low-cost model (its Bank of Internet USA operates no physical branches) to deliver strong earnings growth. BOFI EPS Diluted (Quarterly) data by YCharts. Sure, a steadily strengthening economy and improving housing market have played big roles in BofI's strong growth. But the bank, which calls itself the oldest internet-only bank in the U.S., has done a remarkable job keeping its costs low, has steadily grown its deposit base to help fund its loan growth, and has also taken steps to diversify its commercial banking beyond just commercial and personal deposits and residential mortgages. Two recent moves BofI has made show that. First is the deal with H & R Block Inc to take over that company's banking assets. While this will be a seasonal business largely paying off around tax season, it proved to be a real win for BofI last quarter. BofI reported 70% growth in net income, with non-interest fee-based income jumping 179% largely because of the H & R Block partnership. Second, BofI recently agreed to acquire the business lending operations from PacWest Bancorp's Pacific Western Bank, acquiring $140 million in equipment leases that pay an average of 7% interest. While this isn't nearly as significant a deal as the H & R Block partnership, it does offer something that relationship doesn't: further diversification away from consumer spending and steady monthly cash flows. Management expects this new business segment to generate $80 million to $100 million in new leases annually. Even with these moves, the bank's lending arm is still the big cash flow and income engine. Last quarter, net interest income grew 37% to $69.6 million, compared to $23.2 million in non-interest income. Bottom line: Lending, and largely mortgage-based lending, remains BofI's bread and butter. Despite the capital markets [i.e. stock price] impact, there's been no impact on the performance of the business, as today's outstanding results and our growth plans demonstrate. The bank is in a strong regulatory standing, with no enforcement actions, has not been fined a single dollar by any regulatory agency and has not been required to modify its products or business practices. Case in point: BofI has completed two acquisitions over this time, both of which involved some level of regulatory scrutiny and approval, including an extensive review by the Office of the Comptroller of the Currency for the H & R Block deal, and regulators have found no smoking guns. Actually, there's been even more scrutiny than just that. The OCC also reviewed claims made by an ex-employee attempting to attain whistleblower status, and found no wrongdoing at the bank. More recently, BofI's Board of Directors engaged the law firm Dentons US LLP to conduct an independent investigation into the various claims being made against the company, and Dentons found no merit to the allegations against the company. Considering that Dentons is the largest law firm in the world, it's hard to see a conspiracy here to hide any wrongdoings at the bank. To start, it's not likely that earnings will shoot up 70% in the fourth quarter. In large part, this is because management said that it expects to capture only about 18% of the net income generated from its H & R Block partnership in the fourth quarter, versus the third quarter, which sees the biggest boost around tax season. But at the same time, the economy has remained steady -- if not growing quickly -- while housing has continued to perform quite well all year. Add it all up, and BofI is likely to report another strong quarter of growth. The unanswerable question is how long it takes before the short seller malaise is over.